Caramel sugar gliders were imported to the USA from the Merauke area of Irian Jaya, Indonesia in October 2009. They are somewhat rare in captivity, but have been increasing in popularity as more breeders begin to work with them. Caramel sugar gliders are a subspecies of the traditional sugar gliders we see regularly in captivity. They have the same cage, handling, and nutritional requirements as traditional sugar gliders. Caramel sugar gliders are about 20% larger than traditional sugar gliders with a caramel colored body, white hands, and a cream face. They make different sounds that tend to be deeper and with more rasp. Caramel sugar gliders are known for their docile personalities, making them an ideal pet. Many keepers house traditional sugar gliders with caramel sugar gliders in pet-only colonies or pairs. They should not be interbred. 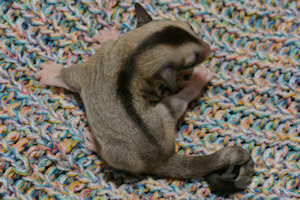 Male offspring from caramel sugar gliders and traditional sugar gliders will be sterile. It is unknown if any other issues would arise from cross-breeding. A caramel joey approximately 5 days out of pouch.